The Pyle enclosed speaker systems delivers stereo sound to any room in your home or office without cluttering floor space. The dual speaker pair feature long-throw woofers that can be used for virtually any in-wall or in-ceiling application. They are perfect for custom installations since they mount flush for a clean and professional look. Additional speaker features include 1-inch titanium dome tweeters, 1-inch high-temperature voice coils, along with an impressive high-power output for full range stereo sound reproduction. Fill the room with high-efficiency audio frequency response rates for rich, dynamic sound performance. The form-fitting speaker design and vented housing enclosures deliver impressive bass response -- with convenient speaker terminals that allow for quick and hassle-free speaker wire connection. Included cut-out template makes installation even easier. 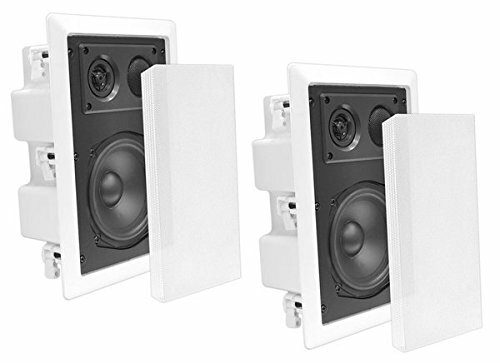 Achieve wide-ranged sound performance and add audio to any room with the Pyle In-Wall / In-Ceiling Speaker Systems. Sold as pair.